Handbrake is a great free open source and cross-platform program for video and DVD conversion, but Handbrake 1.0.0 error like unrecognized file type is frequently asked on forums and users can get few practical solutions. How to solve Handbrake not reading file, what formats are supported by Handbrake? You'll find the answers here. If the video file you input to Handbrake is in commonly used format, like MP4, and you still get the respond, Handbrake unrecognized file type, close Handbrake 1.0.0 and open it again to load the video file. Re-installing the program and restarting your computer is the next step you can try to fix the Handbrake error. Notice that Handbrake only supports a certain types of file format. When loading MKV file using Handbrake, for example, you will always get Handbrake error. Some file formats, though on the list of Handbrake supported format list, can also be rejected by Handbrake due to different codecs. In such case, the only and indeed the best solution is to switch away and resort to a Handbrake alternative. MacX Video Converter Pro lets you get away from Handbrake rejected to convert file type. With 320+ video and 50+ audio codecs built in, the program is able to convert SD/HD/4K 8K video to more than 180 video formats and 14 audio formats on Mac OS X(Mojave included), with 83× faster speed and zero quality loss. You are free to convert MKV to MP4, AVI to MOV, FLV to AVI, AVI to MP4, etc. No worries about Handbrake not reading MKV, AVI, MTS, M2TS etc. file any more. You are also allowed to convert video movie to iPhone XS/XR/X/8/7/6S/6 Plus, iPad Pro/Air 2/Mini 4, 3, Android Windows phones directly using the best-in-class Handbrake alternative. Follow the guide below to start video conversion without Handbrake unrecognized file type error. Step 1: Free download Handbrake alternative for Mac, and run it. Here I take how to convert MKV video file, a file type unrecognized by Handbrake. Click "Add File" button to load the MKV video file. 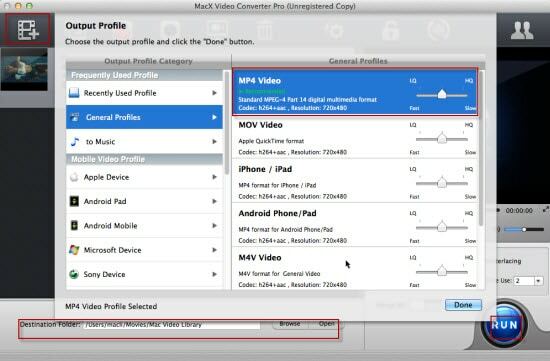 Step 2: You can choose "MP4 Video" as an output format for MP4 is widely accepted, or you can choose specific device profile, like iPhone 6s/6 Plus, iPad Pro, iPad Mini 4, Galaxy S6, HTC, to name just a few. Step 3: Click "Browse" button to choose a folder to save the converted MKV file. Step 4: Click "RUN" button to start the video file conversion with the Handbrake alternative for Mac. When ripping DVDs using Handbrake 1.0.0, some user may find that they receive error message, Handbrake won't find DVD chapters, no valid source found, scan DVD failed, etc. That's because 1. Handbrake doesn't recognize protected DVD file. 2. Handbrake fails to read damaged DVDs. How to let Handbrake recognize the file type? There's nothing else you can do but quit it and try another DVD ripper. 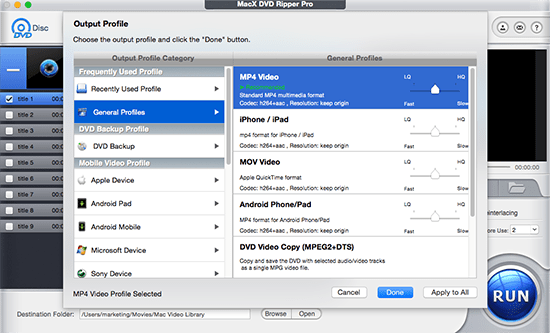 MacX DVD Ripper Pro can 1:1 copy movies on DVDs from Diseny, Paramount, Warner, DreamWorks, etc. with 36× faster speed. It bypass any DVD copy protection technology automatically, be it Region Code, Disney DVD Copy Protection, CSS, Sony ARccOS, and more. Scratched DVDs can be handled, as well. 1:1 copy means that there’s no quality loss. Thanks to nifty interface, it is easy to fix the Handbrake unrecognized DVD file issue. Below is the detailed guide. Step 1: Free download Handbrake alternative for Mac(Mojave included) and run it. Insert your DVD to your computer drive, Click "DVD" button to load the DVD. Step 2: Choose output format. You are allowed to rip DVD to MP4, MOV, AVI, etc. Format or copy DVD to ISO image, video TS folder etc. Step 3: Click "Browse" button to select a folder to save the output file. Step 4: Click "RUN" button to start the ripping process. Handbrake unrecognized file format can be solved once and forever. 1.The video file you wanna input is rejected by Handbrake, Handbrake can not read file it doesn't support. 2. The DVD disc is copy protected, or damaged. Handbrake can not scan such file type. Both of the solutions has been illustrated above. 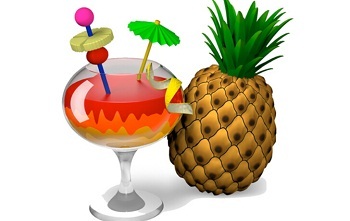 Now check out the list of file type that can be recognized by Handbrake.